The Tigers have played awful baseball lately, not only losing seven of their last eight games, but getting throttled by a wide margin in the process. Their starting pitching has been lit up like a pinball machine, and it put pressure on the Tigers' underwhelming bullpen, which predictably capitulated to the moment. Where a little more than a week ago, it appeared the Tigers were on a leisurely walk to 100 wins, now the cracks in their armor appear to be getting wider. This is a flawed team, but it's still a very good team. Panic? That would be inappropriate at this point. 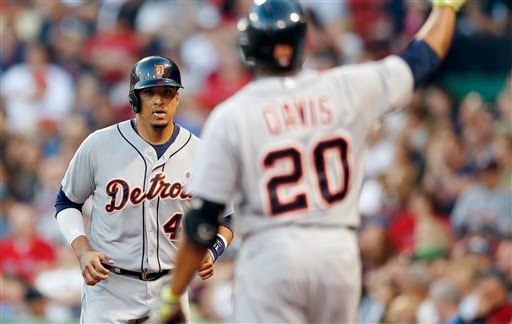 - The Tigers were seven games up in the American League Central when this bad spell began. They are still five games up. The bottom line is the AL Central has, if anything, regressed from last season when Cleveland and Kansas City both seemed to make progress. The rest of the AL Central is under .500. 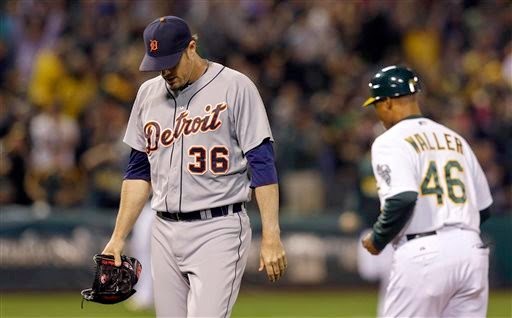 - Chances are the meltdown by the Tigers' starters is aberration rather than trend. While the Tigers' starters have labored, there is no evidence of injury. There is some concern about Justin Verlander after his last two starts. His velocity is down, his walks per strikeout ratio isn't up to his usual standard. Yet, there were the same concerns last year about this time and he eventually snapped out of it. - Help could be on the way. Rookie reliever Corey Knebal throws hard and has a big curveball and looked good in his second outing Monday at Oakland. He dominated in the minor leagues and was a top closer at the University of Texas. He should help. Joel Hanrahan, signed as a free agent coming off Tommy John surgery, should also augment the Tigers bullpen when he is ready. 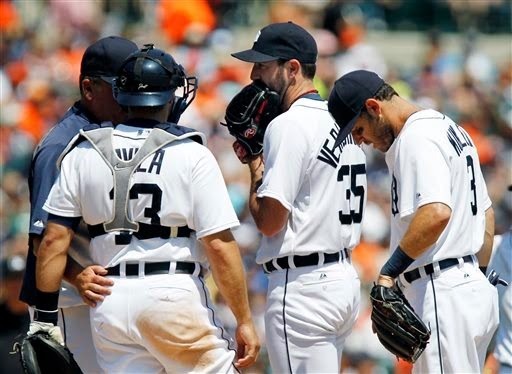 - The Tigers still have a lineup and a starting rotation of premier players. Their bullpen is shaky, they are badly lacking at shortstop and eventually will need offensive production from the left side of the plate (Andy Dirks should eventually help, though). But their strengths still outweigh their flaws, especially when compared to the sorry competition in their division. The Tigers weren't as good as they appeared at 27-12, but they aren't as bad they have appeared these last eight games, either. Somewhere in between is probably 90 wins, and that would easily win the AL Central. The idea is to build to a crescendo in the postseason, after likely augmenting their club near the trade deadline. The Tigers are still on track to do that. Count me among those who felt the Tigers badly needed Stephen Drew. The free agent shortstop, foolishly as it played out, turned down a $14.1 million qualifying offer from the Red Sox to test the free agent market, but re-signed with Boston this week. Drew kills right-handed pitching (.876 OPS last season) and is very good defensively. He also struck out a ton in the postseason last season, which is mostly what Tigers' fans remember about him. The Tigers have gotten away with their lack of left-handed hitting this year, mostly because Rajai Davis is outperforming his career track record vs. right-handed pitching, and Victor Martinez is off to a torrid start. They have problems at shortstop, but Andrew Romine and Danny Worth are good defensively, and the Tigers have been scoring runs. But it's a long season. The idea is to win in the playoffs. The Red Sox knocked the Tigers out of the playoffs. They just re-signed Drew, a player who would have helped the Tigers. I do like prospect Eugenio Suarez, the SS just promoted from Double-A Erie to Triple-A Toledo. He has far more potential as a hitter than Romine and Worth and is a solid defender. But don't be mislead by numbers from Erie. It's a hitter's ballpark. The talent in Triple-A isn't as gifted physically as Double-A, but there are more savvy veterans. If Suarez has a weakness as a hitter, Triple-A pitchers are more likely to expose it. Also, while the right-handed hitting Suarez had a very .850 OPS at Erie, he hit just .215 against right-handers. He is a completely different hitter vs. left-handed pitching (1.191 OPS) than right-handed pitching (.625 OPS). to arrive in Detroit at some point this season, it'd unlikely be as an every day SS. He'd platoon with Romine, a left-handed hitter, who struggles at the plate. It'd make his presence less enticing, at least based on what we know so far. Former Tigers' manager Sparky Anderson made the 40-game mark famous back in the day. It'd be early in the season, he'd be asked about his club's start, good or bad, and say, "Get back to me at the 40-game mark." What was so funny about it is that at 40 games, then he'd say, "Talk to me at the All-Star break. It's a long season." Then, at the All-Star break, it would be, "Season's not over...that's why they play 162..."
Myth - The Tigers are winning because they are so much more aggressive on the bases and so much better balanced. Fact - The Tigers are winning because they are hitting with power and their starting pitching is the best in MLB. It's true, the Tigers do run the bases better. 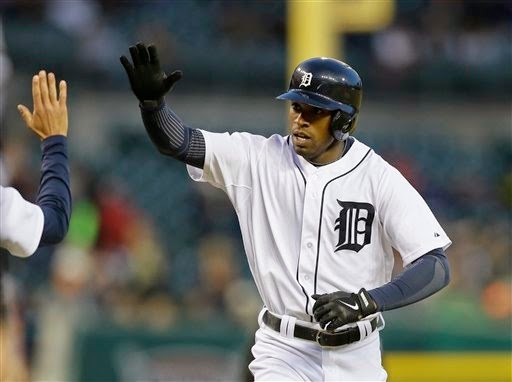 The additions of Rajai Davis and Ian Kinsler, and subtraction of Prince Fielder, has made the Tigers better on the bases. Their stolen bases are up, though, for no other reason than they added a player in Davis, who stole more bases (45) than the Tigers did as a team in 2013 (35). But they have been so impressive offensively because they are hitting so well, and with power. The Tigers are third in MLB and second in the American League in slugging percentage at .430. Victor Martinez has been the key to this. He has replaced whatever power the Tigers have missed from not having Fielder in the lineup. Martinez is hitting .329 with 11 home runs and a .984 OPS. Last season after 40 games, Martinez was hitting .216 with two home runs and a .584 OPS. Myth: Brad Ausmus has made a huge difference as the Tigers' manager. 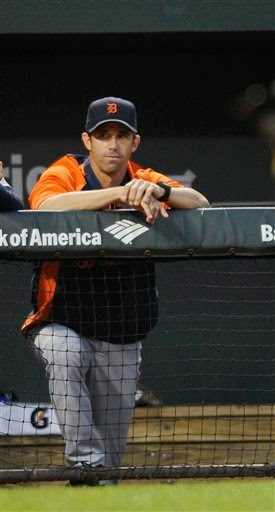 Fact: Ausmus has done well so far, but it's been a smooth ride. After a spring training of injuries, the Tigers have remained healthy and his veteran players have generally been performing up to, or surpassing, expectations. It's true the Tigers steal more bases, but it's more a matter of changed player personnel than strategy. The Tigers don't play "small ball" any more under Ausmus than they did under Leyland. Only Oakland has fewer sacrifice bunts than the Tigers, who have just four. Ausmus has ridden his superior starting pitching as far as he can and then turned to the bullpen, which has a better closer in Joe Nathan. And he's done similarly goofy things with his batting order, like Leyland, including hitting Don Kelly fifth Monday night. The Tigers' 27-13 record is the exact same Leyland compiled during his first season in 2006. And Leyland inherited a team that won just 71 games the year before, and a franchise that had compiled 12 straight losing seasons. We won't really know how good a manager Ausmus is until he faces some form of crisis. There simply haven't been any for the Tigers so far in 2014. For the record, the Tigers were 23-17 last season after 40 games with Jose Valverde as closer, and Martinez and Alex Avila marred in horrific slumps. Six of the Lions 16 games are against NFL North rivals. Winning the division is the key to advancing deep into the playoffs. The wild card route is much more difficult. I gave the Lions draft a C-Plus grade. I liked a lot of their picks, especially North Carolina tight end Eric Ebron and Brigham Young linebacker Kyle Van Noy in the first two rounds. Some of their later picks were fine. It's just they didn't, really, address their needs in the secondary. But how did the Packers, Bears and Vikings do in comparison? I thought the Packers did the best of the NFC teams in this drat. Alabama Ha Ha Clinton Dix is an upgrade at safety. The Packers were vulnerable in the area last year and need an instant starter. 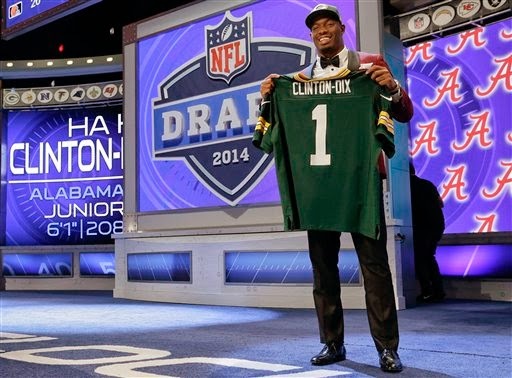 I didn't see Clinton-Dix as the best safety in the draft, but he is a solid prospect and should start immediately. Wide receiver Davante Adams from Fresno State is classic Packers receiver with size and strength and they lost James Jones in free agency Linebacker Carl Bradford from Arizona State was a tremendous fourth-round pick. It will be interesting to see what type of NFL player Ohio State center Corey Lindsey becomes in comparison to the Lions' third-round pick, center Travis Swanson from Arkansas. Chicago did a better job of addressing their needs in the secondary than the Lions. I just don't know whether they got the right cornerback at 14th overall in Kyle Fuller from Virginia Tech. I think Jason Verrett from Texas Christian at 25th overall (San Diego) and Michigan State's Darqueze Dennard at 24th overall (Cincinnati) would have been better selections. I don't mind it, though, when teams trust their own evaluations and go with it. The Bears may very well be right. Minnesota safety Brock Vareen was a great value in the fourth round. He would have fit the Lions. The Bears did address their most glaring area of need, interior defensive line. Ego Ferguson from LSU and Will Sutton from Arizona State need to be effective immediately. There was mixed opinion on UCLA linebacker Anthony Barr, but I thought it was a terrific selection. He is as gifted at his position as another other player in this draft, and was a very productive player. We'll see on Teddy Bridgewater. I think he will be an excellent NFL player. I thought remainder of the Vikings draft was underwhelming. although I was surprised how far Stanford guard David Yankey fell. Seems like he was a solid pick. The Lions got good value with this pick. The Senior Bowl workouts I saw, Reid did flash as a pretty good player. He had back-to-back sacks in the game. He didn't seem overwhelmed as an Ivy Leaguer in a BCS world. The chatter about him was an injury he had (shoulder), and whether he regained his strength from it. But I didn't think he'd last past the third round. I could see Reid as part of the Lions' defensive line rotation at some point this season. It would not shock me if he plays right away. Easily the Lions' best pick beyond the second round so far. I thought the fourth round was a disaster for the Lions from the standpoint there was a predictable run on cornerbacks, which forced them to stretch for one by they time they selected. Nevin Lawson from Utah State is a reach. He is one of those players, who looks the part because he has an athletic build and good speed, but at best he will contribute to the Lions on special teams this season, and it would be a surprise if he develops into any sort of regular player. There was some question he'd be drafted at all. Larry Webster is intriguing prospect. Listed as a defensive end, he has outstanding speed, but is more an athlete than football player at this point. He's a terrific basketball player. Some people see him as a tight end, rather than a defensive end. These type of draft picks are usually busts, but when they hit, they hit big because you can't coach that type of athleticism. Again, it gets back to special teams. Can Webster help there immediately? I didn't like this pick at all. Nothing against Travis Swanson, and center is an underrated spot in the NFL because so many pressures come from inside these days, but it is a pick for the future. Dominic Raiola is going to be the Lions' center this year. The Lions must win now. They have more needs in the secondary. Keith McGill from Utah and Philip Gaines from Rice, both cornerbacks, would have fit better here. So would have safety Terrence Brooks from Florida State, who went a couple picks later to Baltimore.This is where the criticism of the Lions' undervaluing the defensive side of the ball becomes valid. The thing about Kyle Van Noy is he is as ready to play in the NFL as any linebacker in this draft. He is a combo linebacker, meaning he does everything well, and is highly productive. He was a big-time high school recruit and has solid athleticism. I would be shocked if he isn't a starter immediately. It wouldn't surprise me if he becomes a Pro Bowl caliber player. The Lions did have trade up for him. I was surprised he lasted as long as he did. The question is whether he was worth it. Depth is an issue with this team. So is the secondary. While Van Noy should help the Lions immensely, but it still leaves them lacking in the secondary. The Lions were still able to retain their third round draft choice. It will be interesting to see what cornerbacks are still there. Keith McGill, the 6-3 cornerback from Utah, fits the Lions perfectly, but that's pretty deep in the draft. 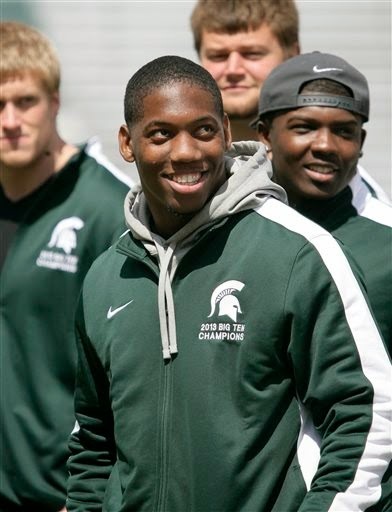 I do expect Stanley Jean-Baptiste from Nebraska to be gone by the time the Lions make their selection. 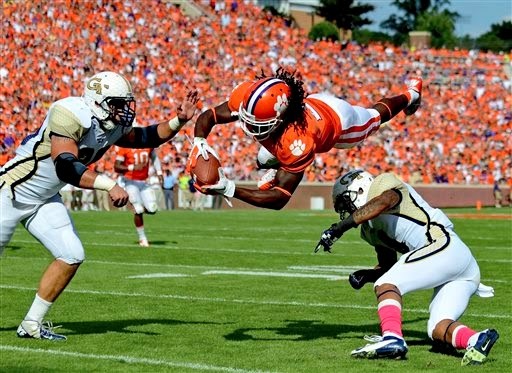 He is a big corner with potential to start in the NFL, who should contribute immediately. It wasn't a good thing for the Lions there was such a run on safeties in the first round of the NFL Draft on Thursday. 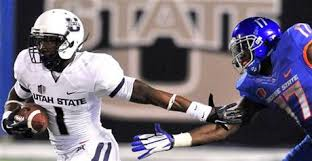 Deone Buccanon from Washington State and Jimmy Ward from Northern Illinois are excellent prospects, much better than they were rated by the so-called draft gurus, who projected them as first-round picks. But there is plenty of defensive talent remaining on the board. 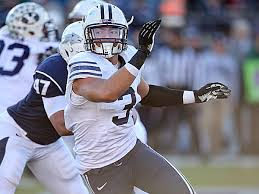 I don't believe BYU linebacker Kyle Van Noy will fall to the Lions' second-round slot. If he does, it is a no-brainer to take him. 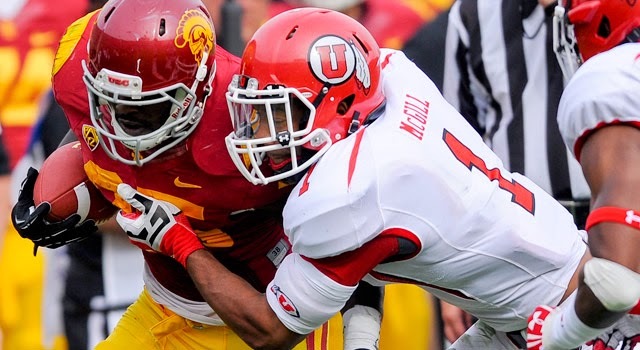 In my opinion, the best cornerback fit for the Lions remaining in this draft is Keith McGill from Utah. He is a big corner (6-3), which the Lions are lacking. He fits the prototype of taller corners the Super Bowl champion Seahawks have used. Cornerback LeMarcus Joyner and safety Terrence Brooks from Florida State are still on the board and would improve the Lions. Cornerback Aaron Colvin from Oklahoma is another player, who would like be able to play right away in the league. Among the linebackers, the one I find most interesting from the Lions' perspective is Trent Murphy from Stanford. Again, I'd stay away from offensive line or interior defensive linemen for the Lions until at least the fourth round. I like the pick for the Lions. I called it long before the draft. I have talked to many fans the last couple weeks, who are upset because they see him as a "tight end," but this kid is different. He gives the Lions a better weapon as a receiver than they could have found from any player not named Sammy Watkins in this draft. He fits their offense perfectly. Remember how important a role the tight end played in the offenses at Indy when head coach Jim Caldwell was there, and at New Orleans when O-coordinator Joe Lombardi was there. Ebron is an extraordinary talent will help the Lions immensely. - Don't trade up. Sammy Watkins and Khalil Mack are terrific prospects, and certainly have a chance to be Pro Bowl-caliber players, or better, but neither is an absolute sure-thing star. Mack, in particular, has been overvalued. 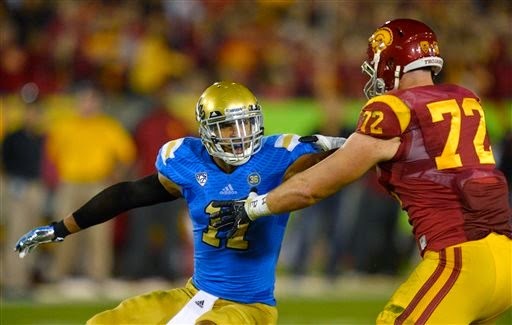 He could be another Aaron Curry, and I'm not so sure if a couple other linebackers in this draft aren't better, Anthony Barr from UCLA and Ohio State's Ryan Shazier. The Lions can't afford to lose draft picks. They have a star caliber wide receiver in Calvin Johnson and first-round draft picks opposing offenses much account for already on their defensive front (Ndamukong Suh, Nick Fairley, Ziggy Ansah). There is no need to reach. What they are lacking is a stellar back seven defensively, and depth. The NFL Draft is about more than the first round. The Lions' failures in the past have come from doing poorly with their picks beyond the first round. - It should be simple. When the 10th overall pick comes up, the Lions should select the best defensive back or linebacker available. The only exception would be if they deem North Carolina tight end Eric Ebron as exceptional, because he could bring a specific ability the Lions are lacking to really put them over the top offensively. And then, the rest of the first two days of the draft should be focused on the back seven defensively for the Lions. That means Oklahoma State cornerback Justin Gilbert, Michigan State cornerback Darqueze Dennard and Alabama safety Ha Ha Clinton Dix should very much be in play at 10th overall. I don't understand why Barr's draft stock allegedly has dropped. He is an outstanding prospect, who played for an NFL defensive coach, Jim Mora, at UCLA and was very productive. A bad sign would be if the Lions took Pitt defensive tackle Aaron Donald or any offensive lineman at 10 overall. It would mean they are still playing for tomorrow instead of today, like they are still rebuilding from an 0-16 season. The window of opportunity may be closing having Matthew Stafford, Calvin Johnson and Ndamukong Suh all together in their prime. The Lions' best course of action is to do all they can to run through it this year. - Two players projected to go later than 10th overall and seemingly not in play at 10th overall, who are better than the players reported in these mock drafts to go that high at their respective positions, are TCU cornerback Jason Verrett and Washington State safety Deone Bucannon. If the Lions took one of those players at 10 overall, they would get panned, but I think they are going to be better NFL players than those rated ahead of them by the so-called draft gurus. Is there a large segment of Tigers' fans who have been overly critical of catcher Alex Avila? With due respect, I believe so. Avila doesn't a good batting average (.238 currently), but he has a good OPS (on base plus slugging percentage), which is more important. It is .773 this season, well above the MLB average of .707. He has a career OPS of .769, also well above the MLB average over that period. Even last season, when he slumped horribly during the first half , Avila ended the year with a .698 OPS (Avila draws walks. His power is streaky, but he does hit his share of home runs. He is also left-handed hitter on a club lacking them. The Avila detractors I've talked on my radio show (and they call consistently after Tigers' games) invariably say he is overrated defensively. But I think it is fair to suggest Avila is solid defensively. Like most catchers he is dependent on his pitchers holding base runners well. He is a good receiver. He seems to have a good rapport with his pitching staff. Avila has hit poorly in the postseason, but he has had a bearing on some of the series the Tigers won defensively (particularly vs. Oakland in '12). While Avila may not be a "strength" for the Tigers in the sense of their star-caliber players, I don't see him as a "weakness," either, especially considering the dearth of quality catching in MLB. Austin Jackson had a number of injury issues last season and didn't perform well by the standards he he had set, especially in the postseason when he turned into a strikeout machine. Yet, one of the more interesting aspects of Jackson's subpar season is he still registered a good number in the Sabermetric category WAR. It was 3.3 in (Baseball Reference version), which ranked him tied for second among Tigers' position players (with Jhonny Peralta) behind only Miguel Cabrera. In 2012, Jackson was eighth in the AL among position players with 5.4 WAR. He was at 5.2 as a rookie in 2010 and 4.9 in 2011 when he had the best defensive metrics in MLB. Only two MLB position players born before the 27-year-old Austin Jackson have accumulated a better career WAR: Mike Trout and Jason Heyward. Jackson's OPS two years ago was .856. It's .857 this season. It's the definition of a bounce back season. The most impressive aspect of Jackson is his ability to adjust. After his outstanding rookie season, he struggled to start 2011, but fought through it. He then got rid of his high leg kick as a hitter, and had a big year. Last season didn't go well, but he did some hits in the ALCS after a tough ALDS. This season, he has been very solid after moving down the order. The big adjustment: Cutting back on strikeouts. Jackson's strikeouts per walks ratio had been a disaster area, always well more than two K's per walk. This season, he's struck out 16 times and walked 14. There are a lot of reasons the Tigers are winning right now. They've been getting good production up and down the lineup. As usual, Austin Jackson is getting a bit overlooked.